The Wilmot Union High School academic decathlon team captured its sixth consecutive state title last weekend behind the well-balanced effort of nine students. (From left) senior April Hedberg, senior Grady Duffy, junior Marcus Wolff, senior Ambriel Siggeman, junior Sean O’Dowd, sophomore Iain McCutchan, senior Austin Adam and sophomore Lydia Fielder (Submitted/The Report). 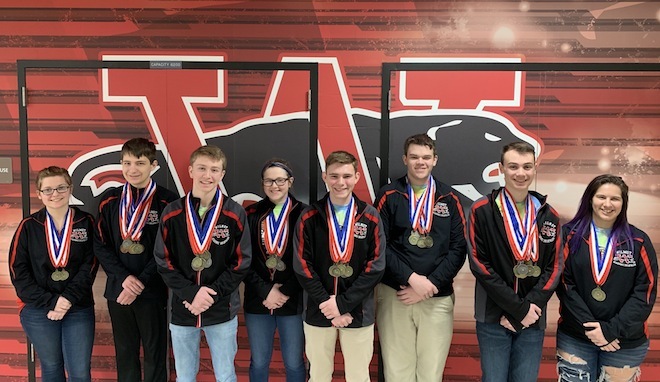 The Wilmot Union High School academic decathlon team returned from state competition in Wisconsin Dells with plenty of hardware in early March, including a sixth consecutive championship, which qualifies the squad for national competition. According to coach Don Serkowski, the team of nine decathletes brought home a collective 32 medals, better than the 21 they garnered in 2018. “This is the second highest scoring team in program history,” said Serkowski, adding the 2016 team still has the top mark. Academic decathlon teams are evaluated in the following categories: art, economics, essay, interview, language and literature, math, music, science, speech, social science and Super Quiz. Serkowski, meanwhile, indicated the team experienced a significant jump from regional competition, where the decathletes placed second to Watertown, which lost some points during the state contest. Wilmot also won seven of 11 team trophies awarded for highest cumulative scores in Language and Literature, which set a state record, along with social science, art, music, science, economics and super quiz. Junior Marcus Wolff, according to Serkowski, played the role of team anchor by garnering seven medals in the honors division. He notched gold medals in social science and music; silver in math and economics; bronze in science, art along with language and literature. In social science, he accumulated 960 points to tie the state record in the category, which also matches Wilmot graduate Carlie Banchi’s score set in 2015. Joining Wolff in the honors was junior Sean O’Dowd, who won four medals, including gold medals in art and super quiz. O’Dowd also had a silver in science and bronze in music. O’Dowd, Serkowski said, was the state’s top scoring competitor while Wolff placed second. Meanwhile, in the varsity division, the team saw two seniors take the top two spots, Austin Adam and Ambriel Siggeman. For Adam, he won gold medals in essay, art, science, social science, language and literature along with a silver for economics. Siggeman, who had a bronze in economics, also picked up silver medals for art, social science, science and language and literature. The four decathletes, who were named to the all-state team, had senior scholastic competitor Grady Duffy join them. Grady picked up silver medals in language and literature, along with bronze medals in art, music, science and social science. Sophomore Iain McCutchan, who won gold medals in language and literature, art and science, also had a silver in social science and bronze for music. Next up for the decathletes is national competition held in Bloomington, Minnesota from April 25-27.